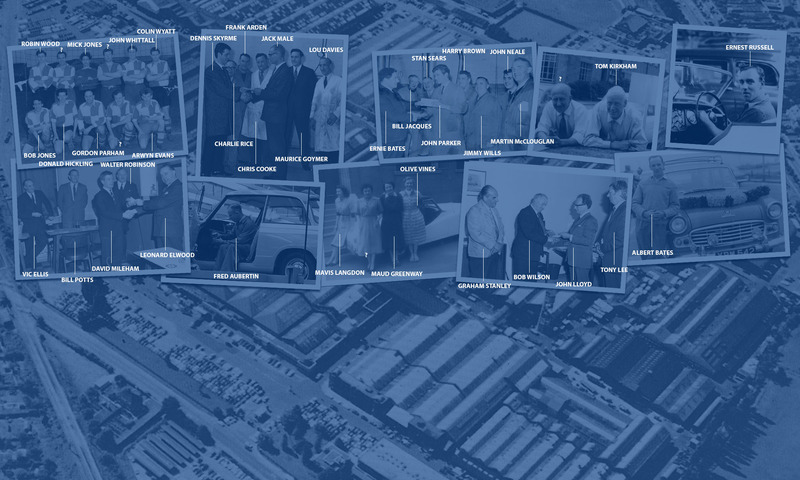 We can date the photos to cAugust 1959 as the Herald, in it’s first year of production, shows a number of 1959 elements to the cars. The series of photographs also show exterior shots which certainly indicate the summer. We’ll post the other photos in due course in the meantime here’s a taster with a couple of workers, one we may be able to recognise. The site is prior to the new Assembly Hall (The Rocket Range) which wouldn’t be operational until January 1961. This area sees the first fit. The Herald is engine-less but elements such as the windscreen wiper can be seen fitted. In the left foreground is a windscreen ready to be fitted. 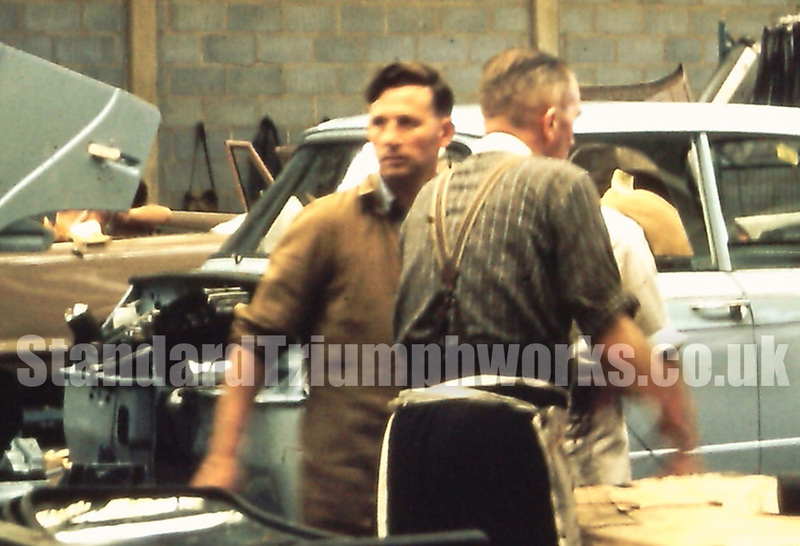 The Herald has a petrol tank, rear lights, front lights (but not the headlamp bezels yet), door handle, Chrome bonnet catch, early bonnet handle, TRIUMPH letters on the bonnet and the stainless trim body moulding down the sides. 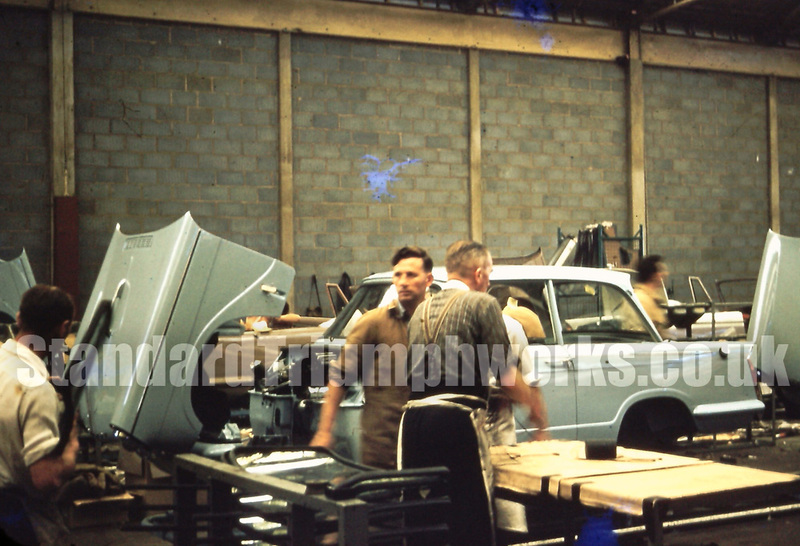 Here’s the whole photo, which again gives us clues… The windscreen in the foreground is actually a series – and initially we thought the black blurred mark on the left of photo was a photo/printing mark, but it’s a windscreen rubber, no doubt with windscreen that the worker is holding. Do you recognise anyone? Please get in touch if you do.